UPR Products Upper & Lower Torque Box and Floor Pan re-enforcement kit will make your 79-04 Mustang Rear Suspension Bullet Proof. Giving your Mustangs Suspension the Strength and Consistency you need to Run with the Best. Whether youre running 7 second ETs in the ¼ mile, road racing, or just driving It like you stole it. UPRs Upper & Lower Torque Box and Floor pan Upgrade Package will Eliminate or Repair any Torque Box Problems. Exclusive Process and Material: Made from 11 Gauge Grade 50 High Strength Marine Steel, Laser Cut for Precision Fit and Finish. Upper Kit Includes: 2pc. Upper re-enforcement Plates, 2pc. Upper re-enforcement Boxes, 24pc. Upper Hardware Kit (Grade 8). Lower Kit Includes: 2pc. 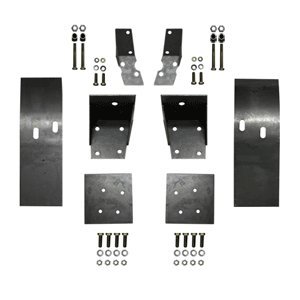 Lower re-enforcement Plates, 2pc. Lower re-enforcement Boxes, 24pc. Lower Hardware Kit (Grade 8). 1979 1980 1981 1982 1983 1984 1985 1986 1987 1988 1989 1990 1991 1992 1993 1994 1995 1996 1997 1998 1999 2000 2001 2002 2003 2004 GT V8 Cobra Mustang Steeda Roush & Saleen Vehicles. No one else can stack up to the bold clean styling of our aftermarket Billet dress ups, Street Strip & Racing Suspension & Performance Parts for your late model American Muscle Car!